The GenMAPP project is no longer funded or actively supported. 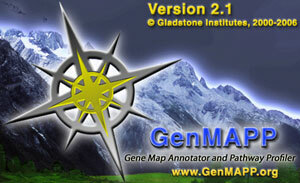 The last version of GenMAPP was GenMAPP-CS, which is available as a beta version. More information about GenMAPP-CS here. PathVisio: PathVisio is a pathway analysis tool that allows you to draw, edit and analyze biological pathways. GO-Elite: GO-Elite identifies a minimal non-redundant set of biological ontology terms or pathways to describe a particular set of genes or metabolites. Cytoscape: Cytoscape is a software platform for visualizing complex networks and integrating these with any type of attribute data. WikiPathways: WikiPathways is an open, collaborative platform dedicated to the curation of biological pathways. AltAnalyze: AltAnalyze is an application for microarry, RNA-Seq and metabolomics analysis. For splicing sensitive platforms, AltAnalyze will assess alternative exon expression along protein isoforms, domain composition and microRNA targeting.